9.1. A steel wire of length 4.7 m and cross-sectional area 3.0 × 10–5 m2 stretches by the same amount as a copper wire of length 3.5 m and cross-sectional area of 4.0 × 10–5 m2 under a given load. What is the ratio of the Young’s modulus of steel to that of copper? The ratio of Young’s modulus of steel to that of copper is 1.79 : 1. 9.2. 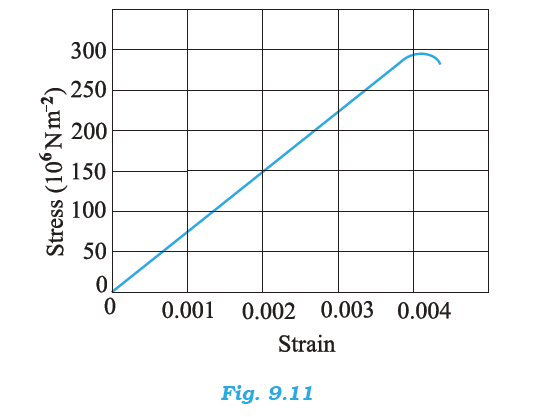 Figure 9.11 shows the strain-stress curve for a given material. What are (a) Young’s modulus and (b) approximate yield strength for this material? 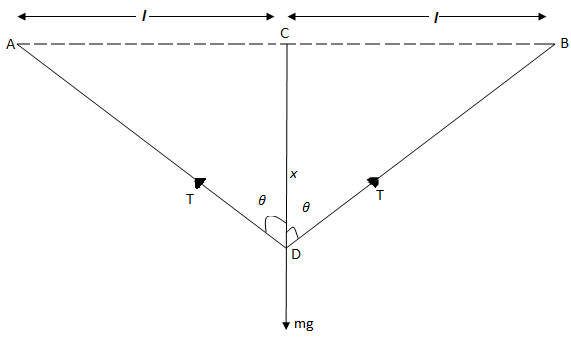 (a) It is clear from the given graph that for stress 150 × 106 N/m2, strain is 0.002. Hence, Young’s modulus for the given material is 7.5 ×1010 N/m2. (b) The yield strength of a material is the maximum stress that the material can sustain without crossing the elastic limit. It is clear from the given graph that the approximate yield strength of this material is 300 × 106 Nm/2 or 3 × 108 N/m2. 9.3. 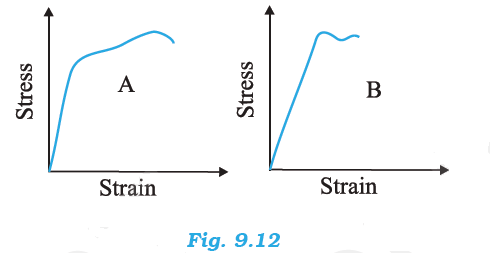 The stress-strain graphs for materials A and B are shown in Fig. 9.12. (a) From the two graphs we note that for a given strain, stress for A is more than that of B. Hence, Young's modulus (=stress/strain) is greater for A than that of B. (b) A is stronger than B. Strength of a material is measured by the amount of stress required to cause fracture, corresponding to the point of fracture. (b) The stretching of a coil is determined by its shear modulus. (a) False, because for given stress there is more strain in rubber than steel and modulus of elasticity is inversely proportional to strain. (b) True, because the stretching of coil simply changes its shape without any change in the length of the wire used in the coil due to which shear modulus of elsticity is involved. 9.5. 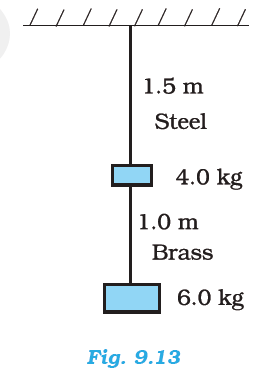 Two wires of diameter 0.25 cm, one made of steel and the other made of brass are loaded as shown in Fig. 9.13. The unloaded length of steel wire is 1.5 m and that of brass wire is 1.0 m. Compute the elongations of the steel and the brass wires. Elongation of the brass wire = 1.3 × 10–4 m.
9.6. The edge of an aluminium cube is 10 cm long. One face of the cube is firmly fixed to a vertical wall. A mass of 100 kg is then attached to the opposite face of the cube. The shear modulus of aluminium is 25 GPa. What is the vertical deflection of this face? The vertical deflection of this face of the cube is 3.92 ×10–7 m.
9.7. Four identical hollow cylindrical columns of mild steel support a big structure of mass 50,000 kg. The inner and outer radii of each column are 30 cm and 60 cm respectively. Assuming the load distribution to be uniform, calculate the compressional strain of each column. Hence, the compressional strain of each column is 7.22 × 10–7. 9.8. A piece of copper having a rectangular cross-section of 15.2 mm × 19.1 mm is pulled in tension with 44,500 N force, producing only elastic deformation. Calculate the resulting strain? 9.9. A steel cable with a radius of 1.5 cm supports a chairlift at a ski area. If the maximum stress is not to exceed 108 N m–2, what is the maximum load the cable can support? Hence, the cable can support the maximum load of 7.065 × 104 N.
9.10. 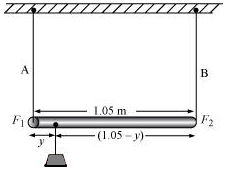 A rigid bar of mass 15 kg is supported symmetrically by three wires each 2.0 m long. Those at each end are of copper and the middle one is of iron. Determine the ratio of their diameters if each is to have the same tension. The tension force acting on each wire is the same. Thus, the extension in each case is the same. Since the wires are of the same length, the strain will also be the same. 9.11. A 14.5 kg mass, fastened to the end of a steel wire of unstretched length 1.0 m, is whirled in a vertical circle with an angular velocity of 2 rev/s at the bottom of the circle. The cross-sectional area of the wire is 0.065 cm2. 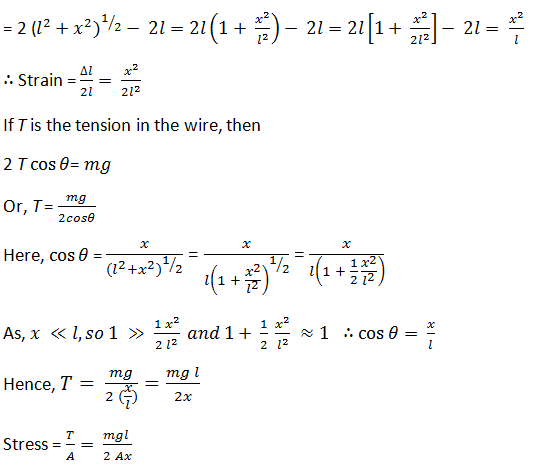 Calculate the elongation of the wire when the mass is at the lowest point of its path. Let Δl be the elongation of the wire when the mass is at the lowest point of its path. Hence, the elongation of the wire is 1.87 × 10–3 m.
9.12. Compute the bulk modulus of water from the following data: Initial volume = 100.0 litre, Pressure increase = 100.0 atm (1 atm = 1.013 × 105 Pa), Final volume = 100.5 litre. Compare the bulk modulus of water with that of air (at constant temperature). Explain in simple terms why the ratio is so large. This ratio is very high because air is more compressible than water. 9.13. What is the density of water at a depth where pressure is 80.0 atm, given that its density at the surface is 1.03 × 103 kg m–3? Let the given depth be h.
Let ρ2 be the density of water at the depth h.
Let V1 be the volume of water of mass m at the surface. Let V2 be the volume of water of mass m at the depth h.
Let ΔV be the change in volume. Therefore, the density of water at the given depth (h) is 1.034 × 103 kg m–3. 9.14. Compute the fractional change in volume of a glass slab, when subjected to a hydraulic pressure of 10 atm. Hence, the fractional change in the volume of the glass slab is 2.73 × 10–5. 9.15. Determine the volume contraction of a solid copper cube, 10 cm on an edge, when subjected to a hydraulic pressure of 7.0 ×106 Pa. Therefore, the volume contraction of the solid copper cube is 5 × 10–2 cm–3. 9.16. How much should the pressure on a litre of water be changed to compress it by 0.10%? 9.17. Anvils made of single crystals of diamond, with the shape as shown in Fig. 9.14, are used to investigate behaviour of materials under very high pressures. Flat faces at the narrow end of the anvil have a diameter of 0.50 mm, and the wide ends are subjected to a compressional force of 50,000 N. What is the pressure at the tip of the anvil? 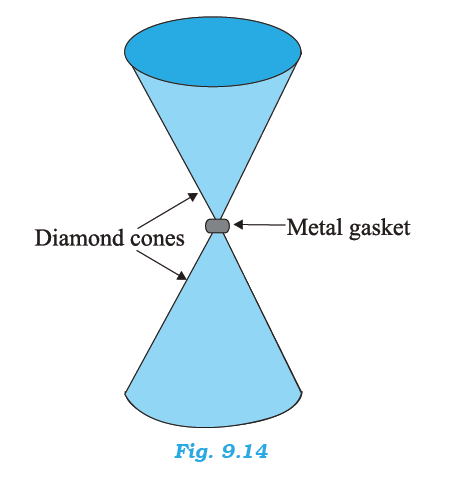 Therefore, the pressure at the tip of the anvil is 2.55 × 1011 Pa.
9.18. 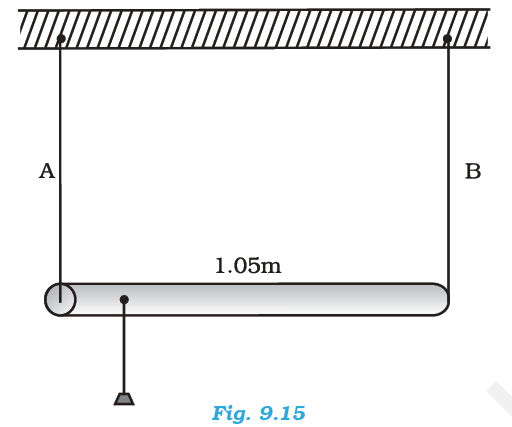 A rod of length 1.05 m having negligible mass is supported at its ends by two wires of steel (wire A) and aluminium (wire B) of equal lengths as shown in Fig. 9.15. The cross-sectional areas of wires A and B are 1.0 mm2 and 2.0 mm2, respectively. At what point along the rod should a mass m be suspended in order to produce (a) equal stresses and (b) equal strains in both steel and aluminium wires. 9.19. A mild steel wire of length 1.0 m and cross-sectional area 0.50 × 10–2 cm2 is stretched, well within its elastic limit, horizontally between two pillars. A mass of 100 g is suspended from the mid-point of the wire. Calculate the depression at the midpoint. Let x be the depression at the mid point i.e. CD = x. 9.20. Two strips of metal are riveted together at their ends by four rivets, each of diameter 6.0 mm. What is the maximum tension that can be exerted by the riveted strip if the shearing stress on the rivet is not to exceed 6.9 × 107 Pa? Assume that each rivet is to carry one quarter of the load. 9.21. The Marina trench is located in the Pacific Ocean, and at one place it is nearly eleven km beneath the surface of water. The water pressure at the bottom of the trench is about 1.1 × 108 Pa. A steel ball of initial volume 0.32 m3 is dropped into the ocean and falls to the bottom of the trench. What is the change in the volume of the ball when it reaches to the bottom? The ball falls at the bottom of the Pacific Ocean, which is 11 km beneath the surface. Let the change in the volume of the ball on reaching the bottom of the trench be ΔV. Therefore, the change in volume of the ball on reaching the bottom of the trench is 2.2 × 10–4 m3.